The migration of contact centers from on-premises to the cloud is well underway and dramatically changing how companies deliver customer experience. 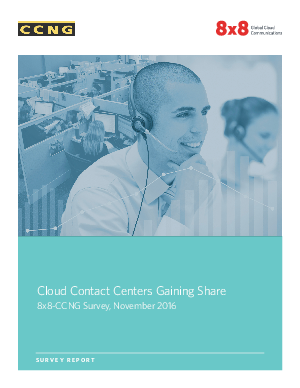 That’s the conclusion of this 2016 survey by 8x8 and the Contact Center Network Group (CCNG) of 154 contact center professionals in the U.S. and UK. The November 2016 survey results uncover a range of trends and opportunities that highlight the importance of analytics, the increase in remote working, and the integration of more non-voice channels into the contact center.